If you’re in the mood for a traditional rib-busting roast, Seafire Steakhouse & Bar is guaranteed to get your Christmas juices flowing. 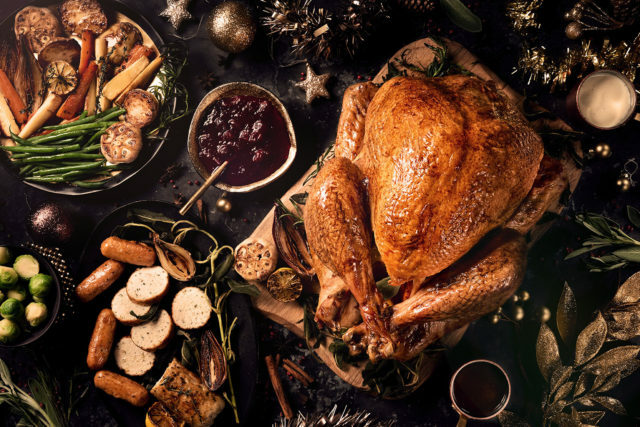 While a live jazz band entertains, you can enjoy a set menu featuring favorites like roast beef, short rib croquettes and a roast turkey with all the trimmings, along with Christmas pudding and festive Christmas cocktails. Cost: AED 295 per person (excluding beverages). A la carte and kids menu also available. Cost: Six-course set menu costs AED 295 per person (excluding beverages). A la carte and kids menu also available. Cost: A la carte menu is available. Santa alert! 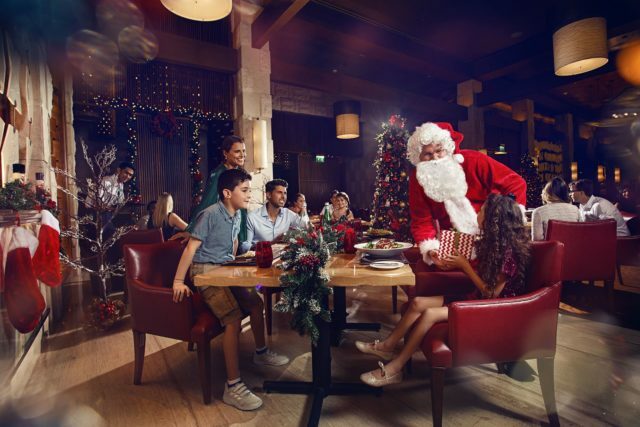 One of the best family options at Atlantis this Christmas can be found in Saffron, which is offering up a buffet of festive favorites throughout the restaurant, along with Christmas music and an appearance by Kris Kringle during the dinner experiences. If you’re in a party mood, the Christmas brunch (21+ over) will feature 16 different beverage stations and a live DJ turning up the Christmas tunes. Cost: AED 325 per person (excluding beverages), AED 162.5 for kids ages 4 to 11. Cost: AED 535 per person (including selected house beverages) (only 21+). Cost: AED 275 per person (excluding beverages), children under 4 years eat for free and children above 12 are charged at the regular price. Cost: Two-course set menu for AED 190, three-course set menu for AED 240, four-course set menu for AED 290 (all packages are excluding beverages.) The a la carte menu will also be available. Come down to sample the different flavors and styles at Kaleidoscope… with a festive touch! The family-friendly restaurant will be featuring live cooking stations and European Mediterranean specialties from a buffet style menu, complemented by dishes from Northern Africa, India and the Levant region. For anyone in search of a traditional British Christmas, head down to the world-renowned Bread Street Kitchen & Bar and enjoy a selection of Gordon Ramsay’s signature dishes, including the legendary turkey Wellington, along with brunch offers, and set menus featuring favorites like Scottish salmon and a festive bread & butter pudding. For a Middle Eastern twist on your Christmas celebrations, Ayamna is set to feature traditional selections like roast turkey with chestnut and oriental rice, along with all your favorite Lebanese foods. While live Arabic musicians keep guests entertained, you can indulge in a bespoke vegetarian and set menu featuring mixed grills, hot and cold mezzeh, shish taouk, lamb kofta and our personal fave… a chocolate Christmas ball for dessert! Cost: AED 225 per person (excluding beverages), AED 112.50 for the kid’s menu. Want to spend your Christmas ‘under the sea’? Head down to seafood restaurant Ossiano where you can dine with the fishes surrounded by the stunning Atlantis aquarium. They’re offering a special eight course ‘Spherification’ menu featuring luxury dishes like Gillardeau oysters, foie gras “terrine”, lobster and black truffle as well as the signature rainbow trout “Floating Island”, along with live entertainment all night. Cost: Seven-course set menu for AED 995 per person (excluding beverages). Wine pairing is available for AED 550 per person. Cost: Lunch menu for AED 375 per person (excluding beverages). Cost: Set menu for AED 995 per person (excluding beverages). The a la carte menu is also available. For the ultimate Christmas feast, Atlantis is giving you the option to pre-order a succulent turkey with all the trimmings along with other festive favorites — we think it’s the perfect way to enjoy the holiday without the stress of cooking! To make your order, call +971 44 261454 or email DXB-Platos@atlantisthepalm.com. Here are the details..
Is that enough choice for your Christmas celebrations?! 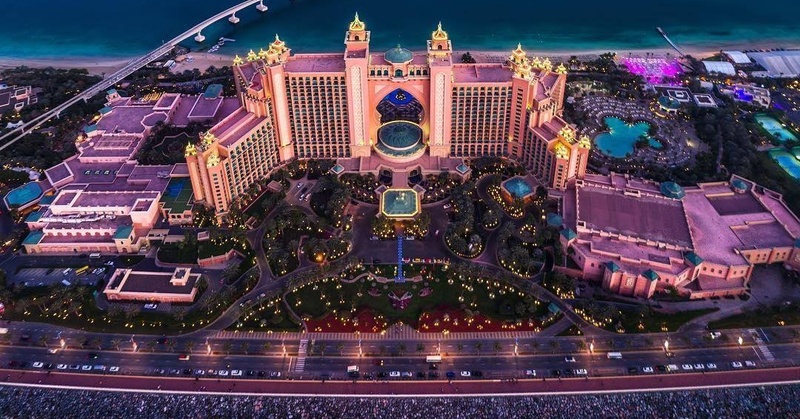 Head to Atlantis, The Palm this festive season and let the feasting begin! For reservations, call +971 4 426 2626 or email restaurantreservations@atlantisthepalm.com.